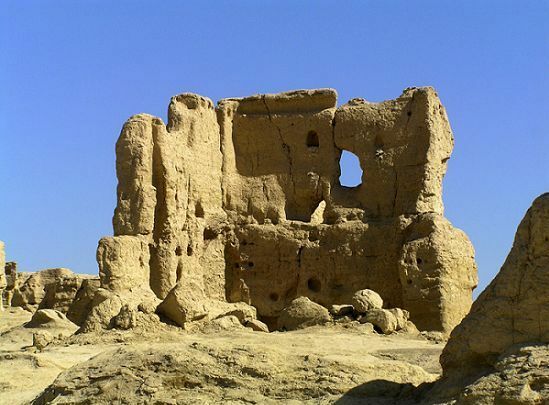 The Ruins of Jiaohe Ancient City (jiāo hé gù chéng yí zhǐ 交河故城遗址) are situated in the Yaernaizi Valley, 10 kilometers (6.2 miles) west of Turpan (tǔ lǔ fān 吐鲁番) in Xinjiang Uygur Autonomous Region (xīn jiāng wéi wú ěr zì zhì qū 新疆维吾尔自治区). The Ancient City of Jiaohe (Yarkhoto) was built with rammed earth and bricks 2300 years ago. 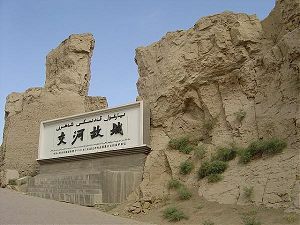 The city, situated along the Silk Road, was of great military significance and played an important role in the economic communication between Western and Eastern countries. Jiaohe means "intersecting rivers" and the ruins are located on top of a 30 meter (98ft) cliff carved out by 2 long dried up rivers. The landform of the Jiaohe Ruins is narrow and long, and from northwest to southeast, it is 1,760 meters long. With a maximum width of 300 meters, The Jiaohe Ruins occupies a total area of 430,000 square meters, of which 360,000 square meters are construction areas. In the Western Han Dynasty (xī hàn 西汉), this city served as the capital of “Anterior State of Cheshi”, one of the 36 kingdoms in the West Region. During the Tang Dynasty (táng cháo 唐朝), the government of the Tang Dynasty established Jiaohe County here that was under the jurisdiction of West Prefecture of the Tang Dynasty. “Anxi Frontier Command” (ān xī dōu hù fǔ 安西都护府), the highest military and administrative organ established by the Tang Dynasty in the West Region, once was set here, and later it was moved to Qiuci (guī zī 龟兹)(modern Kuqa County). In the sixth century the Qu ruling house established the Prefecture of Jiaohe here. It was eventually incorporated into the Uighur empire in the 9th century BC. The city was at its cultural peak under the Uighurs, but Mongol rebellions led to its demise and by the Yuan dynasty (yuán cháo 元朝)(1280-1368AD) Jiaohe was deserted. After having experienced all kinds of changes and erosion by wind and rains for more than 2,000 years, the main structure of the architecture layout of the Jiaohe Ruins is still well preserved till the present day, which is really a miracle. This is mainly due to the dry weather in the Turpan region. 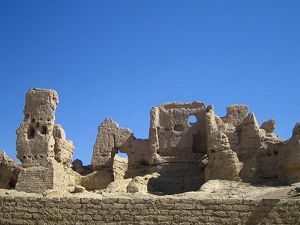 The current scale of the Jiaohe Ruins is mainly the architecture of the Tang Dynasty and architectures are mainly located in the area of about 1,000 meters in the southeast part of the platform. The Ancient City of Jiaohe is the biggest and the most ancient in the world, and it is also the best kept clay soil building city. The city has no walls and is protected by the natural fortification of the precipitous cliffs. The castle was like a bulwark with strong defense. People outside the wall of the castle could not learn information inside the castle, but people inside the castle had a command position over people outside the castle. The architecture layout of the Jiaohe Ruins comprises three parts: one south-north central road running through the city divided the town into two parts. At the northern end of the road there was a temple with a magnificent scale and the construction area in the temple area was about 90,000 square meters. The architectures were mainly rectangular-shaped courtyards, with their doors facing the central road. 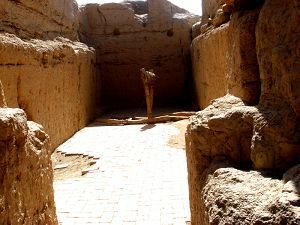 The plain arrangement of each of the courtyards indicates it was a temple, and the square earthen pole in the main room, which might by an altar or pagoda pole, proves this. In the southeastern section of the east part was a large residential area, with construction space of about 78,000 square meters; the northern part was a small-scale residential area while the middle part was the sites of government and military organizations. Majority of the west part was residential area and in addition, there were also handicraft workshops. At the two sides of the central road were high and thick street walls with no windows. The south-north and east-west streets and lanes divided the town into a number of small areas, which were typical arrangements of ancient towns in China.